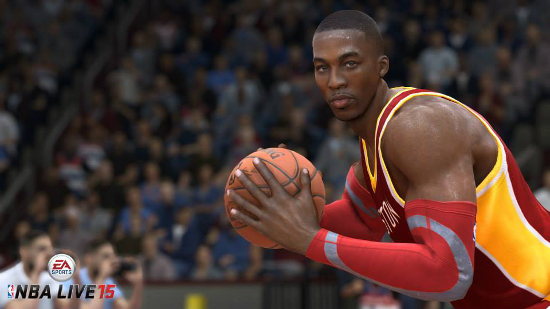 EA Sports released a patch today for NBA Live 15 to coincide with the game’s release. It’s likely the culmination of work done over the weeks that the game was delayed and addresses primarily visual details but also involves some minor gameplay adjustments. Included too is a roster update which is fitting and necessary as the season begins tonight. ♦Updated San Antonio Spurs championship jerseys. ♦Updated courts for Cavaliers, Pelicans, Hornets. ♦Updated jersey icons for MIN alt, MIA Floridians (H. Classics), PHI road, CLE alt 2. ♦Updated accessory colors for new Cavaliers uniforms. ♦Updated team shoe colors for Kings. ♦Updated Jordan shoes for players in Rookie Showcase. ♦Updated player shoes in the All-Star Game. ♦Updated steal rating for Kris Humphries and Jordan Hamilton. ♦Updated accessories on several players. ♦Updated rosters to reflect recent moves. ♦Updated player portraits in Live Ultimate Team. ♦Updated info on several players with playstyles, positions, jersey numbers, ect. ♦Updated “Pull the Chair” post move. ♦Updated catch animations on inbound passes. ♦Updated “Up and Under” layup animations. ♦Updated foot planting with pump fakes. ♦Updated shot timing for free throws.